The UK Work and Pensions Committee is to carry out a far-reaching examination of the pensions industry amid fears that the public is receiving poor financial advice or even falling prey to ‘scams’ and fraudsters when it comes to their savings and retirement incomes. At the heart of the MPs’ concerns is the so-called “pension freedom” reforms of 2015, which allowed customers to draw down their retirement income in lump sums if they so-wished. This has led to some being pressured into making big withdrawals to invest in risky schemes or even being defrauded, said the MPs. 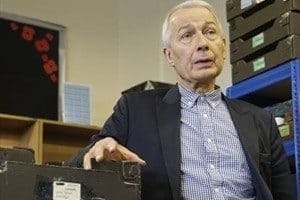 The committee, chaired by Labour MP for Birkenhead Frank Field (pictured left), said that more than $10bn had been withdrawn in lump sums since rules were relaxed, with an associated plummeting in sales of annuities. More than £43m had been lost to fraud, said the committee, referring to police data, and only 7% of pensioners had used the free pensions advice service Pension Wise. There were concerns that some scammers were using the anti-scammer kitemark to lull unsuspecting customers into a false sense of security, leading to their being duped. In a statement, the committee said that concerns over fraud were just part of the picture and that it would also be looking at the broader picture in terms of what people are doing with their savings and whether people are accessing the right kind of impartial advice. Referring to whether the law of unintended consequences had inadvertently applied to then Chancellor George Osborne’s reforms, Field said that the committee needed to look again at what those reforms’ objectives were, and how far they had been achieved. He was “particularly concerned” that the reforms might have made it easier for scammers to prey on pensioners. “Pension freedom and choice liberated savers to choose what they wanted to do with their own money,” he said. “This was welcome, but as with any radical reform it is important to monitor its practical effects closely to ensure it is working as envisaged. “In this case, it is vital that adequate support ensures people are equipped to ensure they don’t make decisions they subsequently regret. “This policy must not become the freedom to liberate people of their savings,” he concluded.